In May, the Institute for Public Relations released survey results in a report investigating the concept of Organizational Clarity, defined as the understanding and alignment an individual employee has about the organization and its vision, mission, values, strategy, and competitive reality. Similar to Organizational Clarity is the Page Society concept of Corporate Character, espoused in the Page Model, which refers to the differentiating identity of the organization expressed through the alignment and activation of similar elements – its mission, vision, values, culture, strategy, brand and business model. According to the Page Model, the organization must authentically embody that character in every interaction in order to be deserving of trust. “Currently under strategy/focus changes, thus making it difficult to see a clear north. Without Organizational Clarity, employees are not aligned with the organizational strategy and the competitive reality. Employees are less likely to feel engaged. They feel less connected to the organization, and productivity declines. Morale suffers, talent leaves. To explore the Organizational Clarity concept, the Institute for Public Relations Commission on Organizational Communication surveyed more than 1,500 employees in five countries—United States, United Kingdom, India, Brazil and China—and six sectors to find out how effectively employees think their organization communicates with respect to three dimensions of employee alignment: their job, the execution of the strategy, and the marketplace. The results revealed information about the five countries and six sectors in each of the three dimensions. In the job dimension, the good news is that most employees understood the core purpose of their organization and found meaning in their jobs. However, fewer employees thought they were compensated fairly. Concerning strategy, employees were less likely to notice an impact on their jobs when the organization’s strategy changes, and said organizations could improve how they use technology to communicate strategy. One critical area of needed improvement was organizations need to do a better job of communicating internally the results of completed initiatives. Employees across countries also complained their organization had too many internal initiatives and their work priorities conflicted. Additionally, some employees said they were more connected with the profession than to their organization. This means that while organizations may have some great programs and initiatives, employees are feeling overwhelmed with the amount of information they receive from the organization. Differences did exist among countries. India’s employees had the greatest degree of organizational clarity, followed by the United States. The U.K. saw the lowest scores. Overall, all countries could improve in terms of Organizational Clarity. 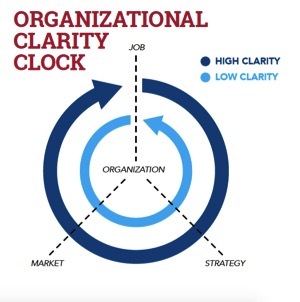 Building on the three key dimensions, a model of the “Organizational Clarity Clock” was constructed where Organizational Clarity is increased when employees are able to understand the marketplace through the lens of the company’s strategy. Closely intertwined, the concepts of Organizational Clarity and Corporate Character have never been as important as they are today, and both are critical to an organization’s, or enterprise’s, success. Employees must have a clear understanding of the purpose of the organization, what it seeks to achieve, and see their work through the lens of their uniquely valuable role in helping to reach that goal. Employees are the foundation upon which the organization is built, and should be placed at the apex of the organization’s strategy. Disconnect must be eliminated. Building on the Page Society’s concept of “Shared Belief,” confidence and trust must be present throughout the process to help lead to actions with positive outcomes. Additionally, as organizational values are deeply ingrained and embedded, improving employee alignment and understanding in an organization’s identity and culture is not something that can be taught in a single-day workshop or a seminar. It takes time, resources, and organizational commitment. CCOs play a vital role in defining and refining the values process, and corporate communications should be driven by the organization’s values. The organization must live and breathe the values, and they should be ingrained in the company’s business model and strategy. Employees must be able to execute and live out these values in everything they do for the organization. Without these values, organizations fail to provide the Organizational Clarity that is required for success. Organizations should think about ditching the traditional broadcast model and adopt a more employee-guided approach where dialogue (including listening) and employee participation are at the forefront. As espoused in the Page Society’s “The New CCO” report, CCOs need to serve as integrators across departments. A lack of integration and alignment is a barrier to Organizational Clarity. When misalignment exists, customers and employees suffer as does company performance. Rather, a more dimensional model for internal communications should exist with dynamic messaging and a focus on culture. While this takes time, organizations must get it right to be successful in the long run. The complete Organizational Clarity study can be accessed here. Tina McCorkindale, Ph.D., President and CEO of the Institute for Public Relations. Follow her on Twitter @tmccorkindale.